Yesterday, I was prompted by Microsoft Outlook 2007 to install Windows Search in order to activate the "Instant Search" feature in Outlook. I followed the links and installed Windows Search 4.0 for Windows XP. Ever since, the computer has been horribly slow. I decide to uninstall Windows Search to see if that fixes the performance issues. The uninstaller gives me the above list of everything I'd updated since the search install, and warns that uninstalling Windows Search may cause these other programs to stop working. 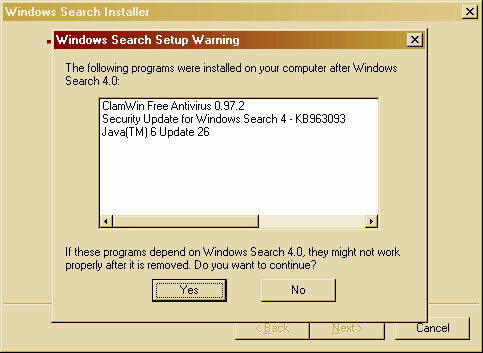 Is the typical Windows user expected to know if Java or their Antivirus software depend on Windows Search? Why isn't there a warning that uninstalling may impact Microsoft Outlook, the program that told me to install Windows Search? This seems to me to be an unnecessary warning that will only plant fear in the minds of users. If there is reason to be afraid, then I believe there is an even bigger problem. What say you? Looks like Windows XP. Anything to convince a user to upgrade, I guess. What was this tool for ; just from the name alone I'd assume it is a full indexing desktop search similar to Google Desktop... if so, was the latency a particularly lengthy full text index operation?